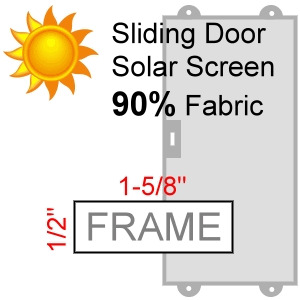 90% Sliding Door Solar Screen using 1/2" x 1-5/8" Framing : Sliding Door Screens are measured using two measurements, a width and height. This sliding door solar screen is made out of the 90% fabric, we recommend the 90% fabric for all doors that get 4 hours or more of sun. We recommend the 80% fabric for doors that get 4 hours or less of sun. This sliding door is very heavy duty, it is made out of the 1/2" x 1-5/8" wide Aluminum framing, very strong and sturdy. This door is likely a much higher grade than what would have come from the sliding door originally from the manufacturer.